When nostalgic recollections in Lucknow turn to Kwan’s Sunday Chinese Buffet the most sadly missed item seems to be the chicken wings. We have not found a restaurant that compares so I decided it was time to try making them myself since Wyatt had shared their secret with me. They are the perfect gluten-free chicken wing because there are only 5 ingredients and at home I can be sure nothing has contaminated the cooking oil. Whisk together soya sauce, oil, salt, garlic powder and potato starch and pour over wings in a plastic bag or bowl. 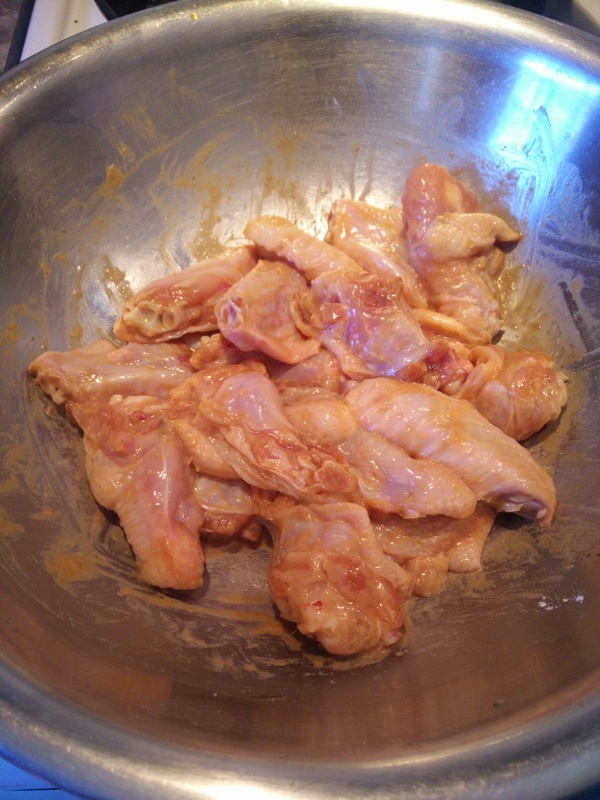 Turn or stir several times to coat wings while marinating for about an hour before cooking. Heat oil in deep fryer to 375 degrees and cook in batches of about 10 so the oil does not drop too much in temperature. Cook for about 7 – 10 minutes depending on the size of wings and your fryer. Raise wings several times to turn them over and prevent sticking to the basket. Eat them as soon as they cool. They do not require any dipping sauce but if you like a little extra flavour try some Thai Sweet Chili Sauce for dipping. This entry was posted in New Gluten-free Recipes and tagged Anne's Favourites, chicken wings, Crispy chicken wings, gluten-free, Kwan's Restaurant Lucknow, Kwans, Lucknow by Anne's Favourites. Bookmark the permalink.